I am trying very hard to bring my Casa del Fascio to an uploadable status. Part of the struggle relates to the dimensions. Have I got them right ? Does it matter ? With such a rigorously geometrical design it somehow seems to. Let's start from first principles. Take an idealised single office. A 4m cube will do nicely. Lay this out in a perfect square, basically a chess-board. Stack this up 4 stories high and we have a perfect half-cube. Obviously the rooms in the middle are starved of light and air, so we hollow out or mass. The result is clearly related to the Italian Palazzo form. But a renaissance palace would never have a grid line in the centre. There would always be an uneven number of bays. So let's adjust the module horizontally to 4.6m square so we can fit a 7x7 array on our site. Then we can do a bit more squeezing to create a narrower bay as a circulation spine, with slightly larger offices along that side. Next we set back the rest of the facade to make room for open balconies. This will open up the building, create a layered transparency and also express the structural frame. We can further enhance this effect by cutting out notches at the top and bottom, marking the position of the central void, and defining the entrance zone. Let's also locate the vertical circulation at either end of the main spine. Add a small balcony recess at top left and transform the central void into an enclosed, top-lit atrium, two stories high, with open galleries on 3 sides. Again this is the palace courtyard, reinterpreted in terms of a modern, hygeinic office block. To close the open ends of the galleries we place large meeting rooms in the middle of the left hand wing. Then locate the washrooms, one stack next to the main stair and a smaller stack at the back close to the meeting rooms. That's the basic scheme. It started with a 4m cube, perfectly regular, and adapted itself to the various requirements of the brief in an apparently logical manner. In some ways it is a very cold and formal composition, but from the inside it is also very open. You can always relate yourself to the central space, which was also intended to house gatherings of the party faithful. We know with hindsight that the party would turn into a monster, but can we blame Terragni for daring to dream otherwise ? The dreams of my youth did not turn out so disastrously, but perhaps they were equally unrealistic. Maybe I was lucky to grow up in an age of "peace & love" rather than the era of "nationalist zeal"
For my presentation in Auckland I developed a dimensional scheme based on multiples of 200mm, taking that to be the size of a glass block, using a column size of 400x400, a floor to floor height of 4200. It seemed to be simple and logical, but the finer details refused to drop neatly into place. So last weekend I hunted through my reference material, hoping for more clues. There is an original floor plan by Terragni himself, but the dimensions are difficult to read. The width of the facade appears to be 33250, edge to edge. But was this the final version ? Was it built to these dimensions ? An Architect's Journal article from 2007 contains a claim that I have come across before, that the building his a perfect half-cube 33200 x 16600. But several sources also claim that the width is slightly greater than the depth. Along the way I developed my window families a little further and came to some interesting conclusions. The internal partitions meet the columns in a rather interesting way. I thought this was just a way of stabilising them and of disguising the position of the internal colums, but this weekend I realised that it also relates to the boxing out of the windows. Looking more closely at my reference material I realised that the windows are fixed behind the wall. They sit inside the room, within the slot created by that intriguing partition wall detail. They are very large sliding sash windows, motorised versions. Many are also L shaped. The resulting facade is a series of layers: recesses, cutouts, external blinds, 3 bands of windows stepping back. I used to work with sash windows in old terraced houses in the north of England. There are wooden boxes on either side to house counterweights. Removable flaps in the sides to access the weights, internal staff beads that can be prised off for maintenance purposes. But that's another post. For now I have cropped out a portion of the rear facade from my work in progress model and uploaded it to Autodesk 360. I have had a request from an architecture student in Italy to post my model of Casa del Fascio, so that will be coming shortly. In the meantime, here is a post that has been sitting around for ages ... kind of a "history of everything"
My second presentation at RTC Auckland was a study of 3 buildings & an exercise in using Revit to drive a research project forward. The theme of the converence was "embracing change". In my mind, if we have fully embraced an idea or a technology it will become transparent. We will no longer be puzzling over what it means or how to really set about using it. Instead we will just get on with the job. My first slide was a play on words. Why am I doing history ? Surely History is all about studying change, trying to find pattern & meaning in the changes that occur in human societies. So if the conference topic is "embracing change" we had better be able to see the changes we are embracing in a historical context, because human beings have been embracing & resisting changes for thousands of years. 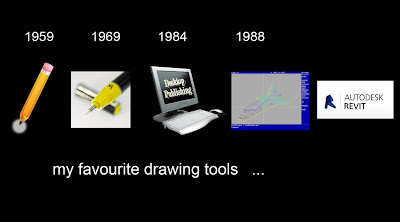 The second slide reflects on my personal history of embracing new drawing tools & techniques. Drawing is a very important way of thinking, analysing & reflecting, processing ideas. Revit is my current favourite "pencil". I aim to treat it like a pencil, something that I turn to without thinking, something that becomes an extension of my hand, eye & brain ... a natural aid to my thought processes. The 3 buildings I chose are all corporate headquarters, and they all deliberately set out to use a bold architectural statement to advertise the credentials of the client body. I often think that architecture walks a knife edge between advertising & art : crass commercialism and profound significance. Interestingly enough the 3 buildings under study have stood the test of time quite well (althought it's a little early to judge the gherkin in these terms) but the organisations or types of organisation that they represent have faired less well. The Fascist Party of Italy has sunk without trace. 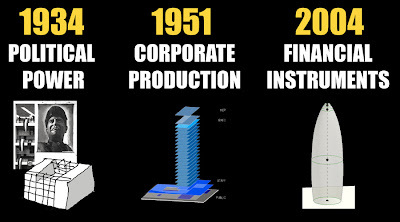 Multi-National Manufacturing is not so well loved as it was in the 1950s. As for Global Finance, well hands up all those who think they have our best interests at heart ? Have you ever tried to draw a map in Revit ? If so you probably discovered that the maximum scale allowed is 1 : 24000. I wanted to draw connections between my 3 buildings by reflecting on the "long duree" of history. I could have used some other software to draw some maps, but that would have been a cop-out. And in any case there are advantages to the single-model approach, use of phasing etc. So I found some jpegs to trace over and set the scale to roughly one thousandth of the real world. And so to tell the story, my first building is in Como, a north Italian town set on the shores of an inland lake. This lake links Como with other towns, some of which are in Switzerland. 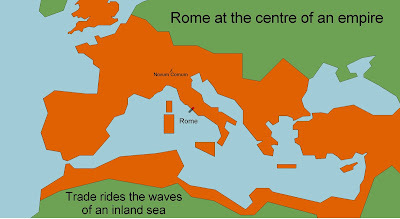 A little over 2 thousand years ago, Como had recently been incorporated into the Roman Empire, an empire that thrived around an inland sea. In this sense, Rome can be seen as a grander version of Como. Fast forward to 1200 or so and Italy is a fragmented entity made up of numerous city states & principalities. The Mediterranean world is divided along a line running roughly East-West into Christendom & Islam. Northern Italy in particular still enjoys a prime position in terms of long-distance trade. Como falls within the ambit of Milan & is participating in a rapidly expanding silk industry. The renaissance is upon us and northern Italy is absorbing all kinds of new ideas, reprocessing them and transmitting them along the trade routes into the rest of Europe. By 1500, the centre of gravity was shifting westwards to the Atlantic Coast. 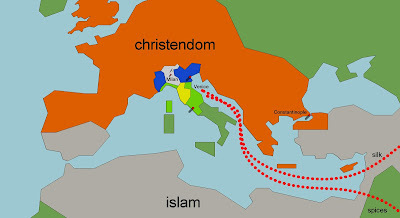 Portugal & Spain had broken free from Muslim rule and were discovering new trade routes that would soon undermine the dominance of Venice which had long controlled the trade in luxury goods from the East. By 1600 the centre had shifted again, Northwards to the Netherlands which had broken free from the Spanish Habsburgs and rejected the notion of absolute monarchy. Here comes the age of the merchants, the invention of the Joint Stock Company, the mobilisation of Venture Capital. For better or for worse we have entered a period of rapid change, huge profits, scientific breakthroughs, exploitation of resources. Across the Atlantic a settlement called New Amsterdam is founded. 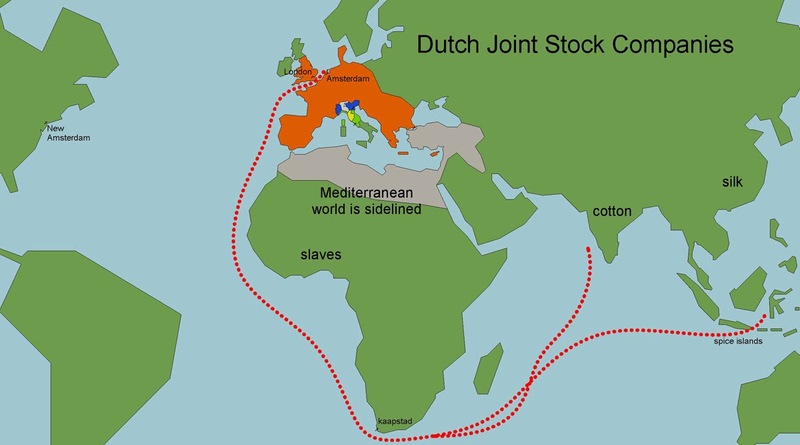 Across the narrow channel, around 1700 a Dutch Prince becomes King of England and the power of the merchants spreads. Before long the London Stock Exchange is the centre of the financial world. Over the next 200 years, Britain surges forward, taking control of India and the vital cotton trade. Vast profits are made importing cheap cotton cloth from India. The wool merchants object & force a ban on finished goods. This stimulates the spinning & weaving trades, and sparks off a series of developments culminating in the factories of the Derwent Valley, where cotton is spun and woven in unprecedented quantities using water-powered machinery. The combination of scientific knowledge, skilled manpower & available capital from profits sparked off a process that we now call the Industrial Revolution. Was it a good thing ? l don't really know. Perhaps my grandson will be able to tell you in 50 years time if we haven't destroyed the planet by then. At any rate, by 1900 factory production had swept away countless trades & cottage industries. Two brothers from Lancashire had used the profits from their grocery business to establish a soap factory. Before long they were exporting all over the globe. 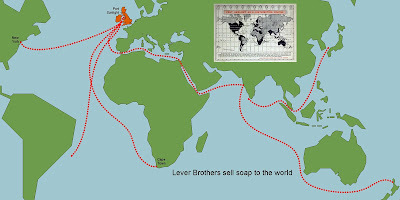 Lever Brothers were pioneers in many ways. They created one of the first Global Brands, built a modern town for their workers, promoted standards of public health & hygeine, made vast profits. So long-distance trade had propelled Western Europe into a position of dominance, but compared to the states of the Atlantic Rim, Italy & Gernamy had missed out. Both countries experienced a surge of Nationalist sentiment and a unification movement. Benito Mussolini rode on the crest of this wave and inspired many a young Italian with hope and belief. Rationalism was an artistic movement that aimed to recapture the humanist spirit of the renaissance and imbue it with modern relevance. Guiseppi Terragni was an immensely talented young architect from Como, a town with strong physical and cultural links to Switzerland and a sense of history reaching back via the renaissance to Roman times, as noted earlier. 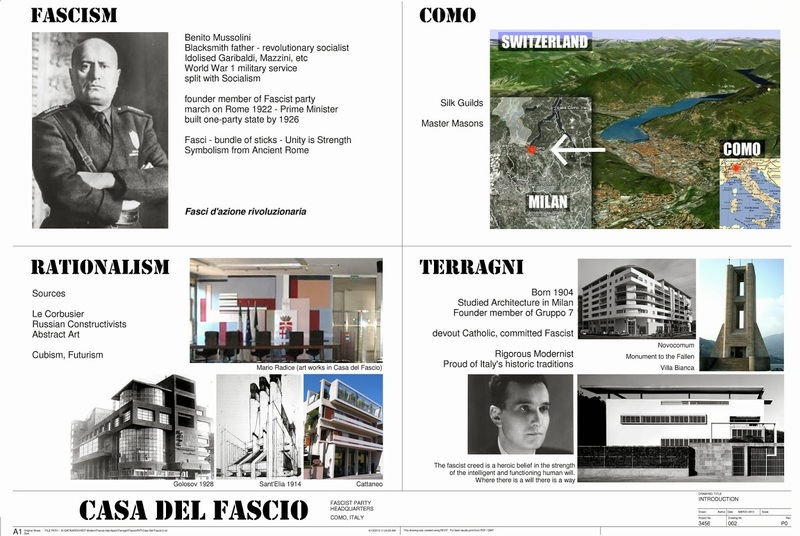 He was a rationalist and an idealist, he saw the Fascist party as a party of the people, by the people, for the people and he made it his business to design their Como headquarters in this spirit. Fascism didn't turn out too well, but Italy (and Germany) managed to find its identity as an integral part of modern Europe, byword for modern style. And the world has moved on. Trade has graduated from the ocean waves to the air waves. 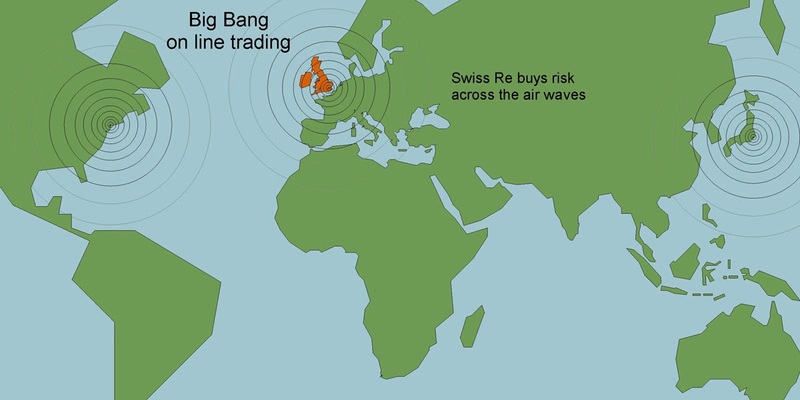 International Finance is the name of the game: electronic trading, insurance, re-insurance, hedge funds. What better building to represent this new world order than the Gherkin, built in City of London by a Swiss finance house. Casa del Fascio, Lever House, Swiss Re HQ. Three buildings, three cities. The Swiss-Italianconnection, the Anglo-Dutch connection, the rise of Europe, the role of shipping. Just trying to see the bigger picture, put a little context to my explorations into the way we build. But before I go a couple of thoughts. 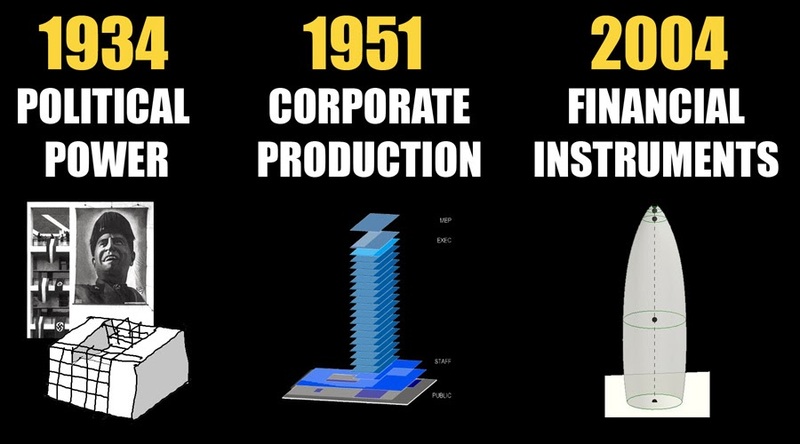 Note how the buildings get bigger, the exponential growth in our aspirations. The quote above is from an article in the Gulf News by an Emarati commentator on Middle East events. His point was that the Arab world may well have to go through some dark times before it can find it's identity, settle down to a more democratic future. My point is that there has to be an alternative to bigger, better, faster. So much of the BIM debate revolves around efficiency, management, putting data to work, smoother workflows, facilitating that exponential growth. Perhaps we can also use BIM to think about our history. Maybe we can even learn a little from the past. This is the long promised follow up and download post. I have taken a standard ootb Revit planting family (RPC deciduous) and modified it to achieve several ends. The symbol family, aka "deciduous base", contains a vertical model line, (invisible) controlled by a "height" parameter; plus a bunch of symbolic lines to represent the tree in plan views. I have separated these 2 components into separate planting families, each nested into the host planting family. There is only one "render appearance" family, which has the capacity to represent many trees. I have opted for 5 "base symbols" which can be selected by means of a type parameter. Rotation is achieved very simply by a labelled angular dimension. This only affects the "render appearance" It would be possible to also rotate the plan symbol by random amounts, but it didn't seem to me that this was necessary. Plans are by the nature rather abstract and formalised. It is in the 3d views that we really want to inject some random variation to better simulate natural plants. The size of the "base symbol" is controlled by a width factor. This varies the height of the invisible line (the "stick") by way of a formula. What matters is the relationship between symbol size and stick size. So a fat tree needs a shorter stick. Hence the formula divides Height by Width Factor to derive Stick Height. By a process of trial and error, you can find an appropriate Width Factor for each species of tree contained within the render appearance. Once set this is good for all time. The way the height scaling works is a bit tricky to explain. All planting families have a type parameter called "Height" baked into them. In the nested family this controls the height of the stick. For each species of tree, the stick height is adjusted to match the height of the Render Appearance. Planting families have a special behaviour. Double nested families will automatically scale so that the tallest piece of geometry in the nested family scales to match the Height parameter in the Host family. You don't have to link any parameters, it just works that way. BUT the Render Appearance is not a normal family, it doesn't count as geometry. So if the Render Appearance is 10% taller than the stick, it will eventually be 10% taller than the stated height in the Host family when this is placed in a project. Even if the stick is removed the Render Appearance will act "as if" there was a stick of the stated height. Don't worry it also confuses me. In the end I solved this by trial and error with only a hazy idea of what was going on behind the scenes. Congrats to Alfredo, Kelvin & Philip for their success in the Pumpkin Challenge. And a big thank you to Zach for making rom for myself ... and for some very kind words. For a couple of milliseconds I thought ... maybe I should have submitted a more conventional entry, certainly I drifted way out on a limb ... but what a ride ! I'm sure that the significance & relevance of what I learned along the way will be filtering through over the coming months. And I'm very proud of the final images, which begin to ask some interesting questions about how BIM & ART can intersect. In retrospect I think that the nature of BIM would need to show through much more clearly for a work to really cross that boundary. If you examine Escher's work, the fascination lies as much in his mastery of the techniques of printmaking, (Wood Engraving, Lithograph, Mezzotint) as it does in the abstract conception of imaginary or impossible worlds. A couple of people have commented that I could just as well have created my images with 3d Studio. Of course that ignores the learning experience, but still it suggests to me that the specific nature of a BIM tool like Revit needs to shine through into the finished work more clearly. One obvious avenue to explore would be the combination of orthographic and perspective views. In a way my uploads to Autodesk 360 are closer to BIM-ART than the final jpegs. But I would need to clean up the files more carefully, restrict the number of views ... I don't know. People gradually figured out how to use still photography and then cinematography for artistic ends. Along the way the nature of art has been brought into question. Cubism, Abstract Art, Surrealism, arose partly in response to the emergence of photography. Of course CG has become an integral part of the film industry, but I'm not sure we have really come to grips with the artistic implications. It's all too easy to slide into overkill, "the society of the spectacle". Art implies more subtlety, more gentle probing of the human condition. In any case, BIM is something different from CG. Very different really. Digital Prototyping. Information content. The coexistence of the orthographic and perspective domains. How do you weave that into the substance of an art work in the same way that Escher wove his craft skills into his creations. You need to look at the way he conjures up reflections and textures with a series of parallel strokes of the burin. Drives me crazy. This could have been just text, but I've woven in some images from the night after my submission. I got the idea of walking into my pictures and looking back at the viewer. What would happen ? Would the illusion break down. I slipped my grandson Jack into the picture ... peering into the doll's house.